Even if you attended, maybe you’re wondering what you missed at 2016 Content Marketing World. It’s the world’s largest content conference, a major live event. So it’s hard not to have FOMO. Don’t worry we’ve got you covered. We’ve got the inside scoop. We went straight to the attendees to get their perspective. These people invested their time and resources to attend this well stocked content marketing knowledgefest in Cleveland. 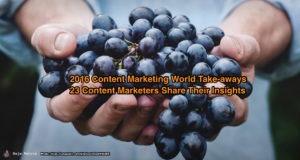 What was your most interesting takeaway from Content Marketing World 2016? 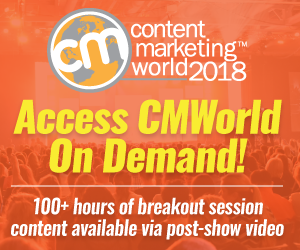 Here’s what 23 Content Marketing World attendees including speakers and exhibitors learned. The different companies and offerings exhibited revealed much more diversity across the “content marketing supply chain” than in past years. In addition to solutions such as email marketing and marketing automation, there were a lot of new “point solutions.” For example, VisibleThread provides content marketers with a tool for “content proposal management and compliance”. The content marketing value chain is expanding. The gaps created between solutions creates opportunity for service providers and consultants. They can integrate these solutions to provide business value. It’s a sign that content marketing is starting to mature. With growth comes confusion and change that drives new opportunities. Editor’s note: Agron presented at Content Marketing World 2016. Great content marketing synchronizes with the lives of our audience to create rich experiences. This demands the full support of the entire enterprise to make them happen. Content Marketing Institute’s Robert Rose showed us how to map our content strategy to real business results. Mitch Joel persuaded us to start focusing on publishing content in the communities we serve rather than bringing audiences to our sites. The big theme that emerged from this year’s Content Marketing World was commitment. Among the areas of focus are your audience, data and relevancy. After last year’s “Trough of Disillusionment”, with realistic expectations, we can realign our content marketing and commit to quality content that serves our audiences and our business. It was my first time to Content Marketing World. I was very impressed with the quality of both the speakers and the audience. The students in my workshop were at all levels with Facebook ad savvy–from one getting the aha moment that it was possible and OK to send traffic to websites outside Facebook, to another teaching ME something! ( namely, that promoting your page’s “Shop Now” button can be very effective.) It was a super positive experience. Also I enjoyed Mark Hamill’s thoughtful wisdom. I loved hearing about the crafts of screenwriting and acting. Hamill’s creative ups and downs. His perspectives were cathartic. We’re at the beginning of transformation of marketing and customer service roles into a single “customer experience” role. Businesses that embrace this evolution early and wholeheartedly will win in this new era. I really liked Doug Kessler’s idea regarding coming up with ‘insight’ not just a piece of content. Editor’s note: Cleary is affectionately known as “The Marketing Tools Guy”. He’s the go-to resource for many top influencers. His blog is worth your time. Content marketing has grown up during the last couple of years. Attendees were highly focused on finding concrete, actionable insights to put into practice. They were much less interested in high level concepts. Content creativity and originality were a more important focus. Editor’s note: Deshpande is the head of Curata, a Content Marketing World exhibitor. Deshpande is a strong proponent of curated content. There’s no room for half measures. At this point in content marketing’s adoption, teams must fully commit to producing truly outstanding pieces at a consistent pace if they hope to have an impact in a very noisy environment. Content Marketing Institute’s Joe Pulizzi: Go “all in” on content marketing. Moz’s Rand Fishkin: 10X content is the only way to make it onto page 1 of SERPs. Build your audience, then monetize it. Andy Crestodina’s keynote was one of the most inspiring sessions at the conference. As he was talking, I couldn’t keep up writing down all the ideas he was sparking for my editorial calendar. Seriously good stuff. Here are 5 key content marketing directives from Content Marketing World. Add humanity and empathy to your story. This is a competitive differentiator. Sales integration is required. Marketing can’t go it alone. Editor’s note: Heinz’s sessions are Content Marketing World sellouts because they’re chocked full of tactics. I was fortunate to meet Heinz at the opening party. Stop doing all the things and do the right things better. It’s extremely important to conduct keyword research before producing content. The better your content is optimized for search, the better chance you have of people finding it organically. Orbit Media’s Andy Crestodina had plenty of other great tips about SEO. Editor’s note: Khoja is the consummate networker. Once she met you, she connected via more than one platform. (She was also the other half of Orendorff’s dynamic duo in content creation.) There’s a lesson here. Create content for your current clients. Use complaints and reviews to help generate that content. Content marketing is a slow game. It takes patience to nurture long-term relationships with users. Don’t design a content strategy expecting a quick sales or short-term ROI. Every year, CMW has a different “energy” around it. This year, so many conversations — and wrap up posts — are focusing on the actions marketers are going to take to “step up” so they can improve their brands (both personal/professional and in support of their organization). I love how this even has encouraged so many people to DO something. Editor’s Tip: Orendorff is a whiz at creating audience attractive content. 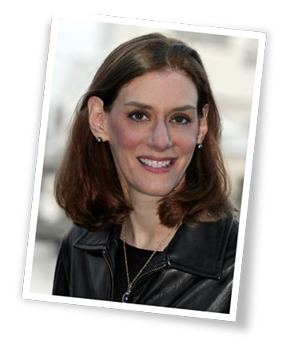 Check out his Content Marketing Institute post on How to Network a Conference Like a Jedi. It’s a new spin on Andy Crestodina’s CMW Yearbook. Do less, better. Slow down to think clearly and strategically. Focus on effectiveness. Sometimes, as content marketers, it feels like keeping up will be impossible. It’s nice to be reminded that doing the basics well matters more than keeping up with every new innovation. That face-to-face time with other marketers working to be better at content is crucial to learning and growth, an experience I consider myself lucky to have been a part of. The underlying thread for me was the idea of “What is your WHY?” It’s not a new idea. Yet it was expressed consistently, differently and intentionally throughout the conference. Tim Washer brought smiles to everyone’s faces as he showed us the power of humor to express your why and connect with customers. Christoph Trappe of Authentic Storytelling. We still have a ways to go in the content marketing industry. Attending a focused business conference not only inspires attendees but also gives them the solid tactics to take their marketing to the next level. Many attendees focused on the main message: Content marketing is here to stay. Content marketing requires commitment to creating quality information. To this end, marketers must focus on understanding the “why” for both their organization and their customers. Realize it may not be the same answer. Further, the consistent refrain was: Do less, BUT do it better. Is your content aligned with your business objectives and related editorial mission? Is your content focused on responding to your audience’s needs? Is your content optimized to provide long-term value to your customers, social media communities, key search terms, influencers and your business? If not, figure out how you can make it work. Don’t feel you have to do everything. Focus on doing the right things well. What was your biggest 2016 Content Marketing World take-away and why? If you’re interested, here are our insights on Content Marketing World 2016. Please note that we edited attendees’ input. Any errors or misrepresentations are ours. Tags Aaron Orendorff, Andrea Fryrear, Andy Crestodina, Ann Handley, Brian Carter, Brian Kolb, Brian Lindamood, Carmen Hill, Chad Politt, Christoph Trappe, Diana Ballard, Doug Kessler, Erika Heald, Ian Cleary, Ivana Taylor, Jacquie Chakirelis, Jay Baer, Jeremy Bednarski, Kristina Halvorson, Lars Silberbaurer, Luiza Gaidzinski, Marlene Oliveira, Matt Heinz, Michele LInn, Mitch Joel, Nadya Khoja, Pawan Deshpande, Robert Rose, Scott Stratten, Shana Pilewski, SUsan Moeller. Bookmark the permalink. So true I work with a plumber agency and I know on many occasions we will look up individuals on Facebook. It can really hurt you when you go online and see pictures that are not appropriate for work on someones Facebook like them smoking weed and doing other things. I know if I see someone with a great Facebook professional images the odds are high they get the job. Very informative post, great information you have shared. Content marketing is the need of an hour but you have to be very precise when you do it. I would say while marketing your content you need to have good knowledge about your domain or theme and business objectives that you are marketing. You must target the relevant audience those can influence your business, use social media lot more and make sure that if you are selling a product or services you must mention them smartly and describe them how it can affect you directly or indirectly. Since I’m also handling a business such post would really help me in future. Keep coming with these posts in future. Thank you.